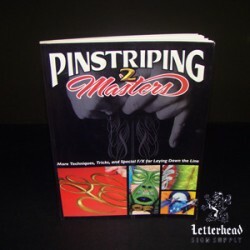 Pinstriping Masters book 2 has More Pinstripe Techniques, Pinstriper Tricks and Pinstriping Special F/X for Laying Down the Line is the long awaited sequel to Pinstriping Masters. Pinstriping Masters book 2 Featurers 25 top pinstriping professionals, each offering step-by-step instruction and super tricks and techniques of the trade. As an added bonus in Pinstriping Masters book 2, the gallery section of each artist has been expanded. Once again, you’ll be amazed at the collection of incredible talent assembled in one book: Andy Anderson, Gary Berg, Jim Bradley, Joe Broxter, Steve Cox, Lyle Fisk, Alton Gillespie, Cary Greenwood, John Hannukaine, Rick Harris, David Hightower, Art Himsl, Bob Iverson, Gary Jenson, Don King, Keith Knecht, Gary Kupfer, Rody Kuschnereit, Rod Powell, Blaine Scott, Jeff Scozzaro, Jeff Styles, Joe Sulpy, Dale Weber, and Clay White.Click here for more information and pricing on Pinstriping Masters 2 book by Craig Fraser. Pinstriping Masters Book 2 Video below.